ur goal is to create a lively and festive atmosphere in which to celebrate your simcha. At the same time, we tailor our repertoire and activities to incorporate our clients’ personalities, heritage, and desired ambiance. Our aim is interacting and connecting with your guests. We can lead games with the kids and we offer dancers/instructor to teach and lead Israeli dancing. As you look through the song sheets you will see some the dances our dancers can teach lead or organize. Read what others have said about Shalom Entertainment. We have performed at hundreds of events, making each one a unique and exciting occassion. 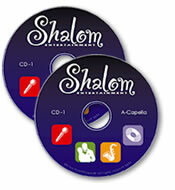 You can listen to orchestra music samples or a cappella music samples online, or we can send you a CD. Just give us a call at 1-800-34-SHALOM or use the contact form.